April 2017. London Marathon 2017. Troubling times for disabled people. Healthy inequalities affecting disabled people. Share plant sale/healthy living community day. There are people involved with Share who are simply heroic. 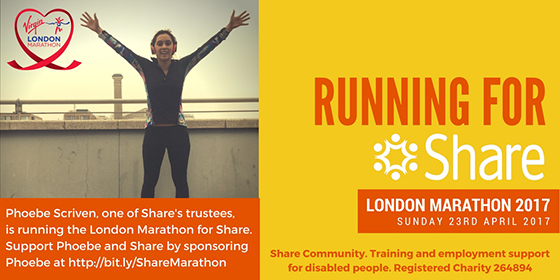 Phoebe Scriven, one of Share's trustees, is one of them, and has been training to run the London Marathon since late last year. Despite injury and working in a high-pressured job, Phoebe takes her role as a trustee so seriously that she not only chairs the fundraising committee and attends all Board meetings, but she’s also raising money for Share by running the London Marathon this year. It says a lot about the extent to which she values Share, and we’re all deeply grateful to her. As you’ll have seen, lots of us at Share are 'getting fit with Phoebe', so here’s hoping it doesn’t all stop after 23rd April. Please do sponsor Phoebe – every little helps, and you’ll be helping us to give more opportunities for fitness and activity to our students. Story after story emerges about people having their benefits cut. The latest shocker was about 51,000 people losing the cars they’d got through the Motability scheme because they’d been turned down for PIP (Personal Independence Payment), the benefit that’s replacing DLA (Disability Living Allowance). The cars are taken even when the claimant is going to appeal the decision, which leaves people stranded, isolated, and in many cases not able to get to work. Three thousand people have been able to rejoin the Motability scheme, but the damage this policy is causing is severe, and if people have had specially adapted vehicles, they’ll have to go back to the drawing board. 65% of decisions are overturned in the clients’ favour at appeal, according to Ministry of Justice statistics. Muscular Dystrophy UK was reported in the Independent as saying that 900 people per week were losing their vehicles. Campaigners are trying to get changes made. Conservative MP, Peter Bone, said: "You need it for mobility purposes and maybe you use it for work, but because you lose your PIP award you lose the car at the same time. "You appeal against the PIP award and ultimately the tribunal awards you back the PIP, but you've already lost the car and maybe your job because of it." A recent BBC News story reported that patients with learning disabilities were missing out on regular health checks. These findings will come as no surprise to anyone working in our sector, but nevertheless make for stark reading. 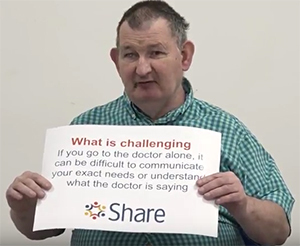 Over the past few months, we've been working with Share students to find out about their experience of using health services in an effort to understand what works well for them and what remains challenging. Check out what our students had to say in this video which raises important points and gives our students a voice that we very much hope will be heard far and wide. 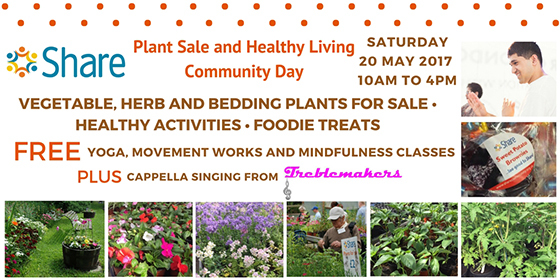 Share is holding a plant sale and healthy living community day on Saturday 20th May 2017 from 10am to 4pm, and you're invited! Join us and find yourself in the tranquillity of the beautiful Share Garden which is based in the grounds of Springfield University Hospital in Tooting. As well as a huge array of vegetable, herb and bedding plants (all grown by Share's horticulture students) to choose from, we'll have FREE yoga, movement and mindfulness classes in the morning for everyone to enjoy. Plus there will be cappella singing from the fabulous Treblemakers who will be performing between 11 and 11:45am. Our pop-up café will also be serving irresistible healthy treats and refreshments, specially prepared by our catering students. Places are limited for the free classes, so if you would like to secure a place for any of these sessions, please email kavitab@sharecommunity.org.uk specifying which session you would like to attend to avoid disappointment. This event is free, but if you register online we can make sure we have enough goodies for everyone! More details are outlined in Share's Services Table. 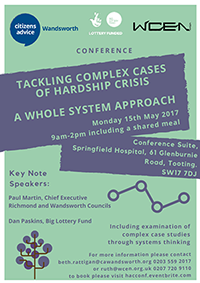 Alternatively, for further information, visit Share's website, email info@sharecommunity.org.uk or telephone 020 7924 2949.